"Giant Hogweed" sounds like a mythical plant that the students of Hogwarts may study, but it's real -- and it's dangerous. The plant grows in the wild and touching it can cause third-degree burns and even blindness. Giant hogweed was recently spotted in Virginia for the first time and may also grow in other states. Warnings have been issued in previous years after discoveries in Michigan, New York and elsewhere in the Northeast, Midwest and Pacific Northwest. The latest confirmed sighting of giant hogweed came in Clarke County, Virginia. It was identified by researchers at the Massey Herbarium at Virginia Tech, who say there are about 30 plants in the area. Giant hogweed is part of the carrot family, and for a toxic plant, it is surprisingly pretty. It can grow up to 14 feet tall, with thick leaves stretching two to five feet across and large clusters of white flowers gracing the top of the plant in an umbrella pattern. The spray of white flowers looks similar to Queen Anne's Lace, but the experts at Massey Herbarium note that giant hogweed is much larger, with chunkier leaves. Why is hogweed so dangerous? 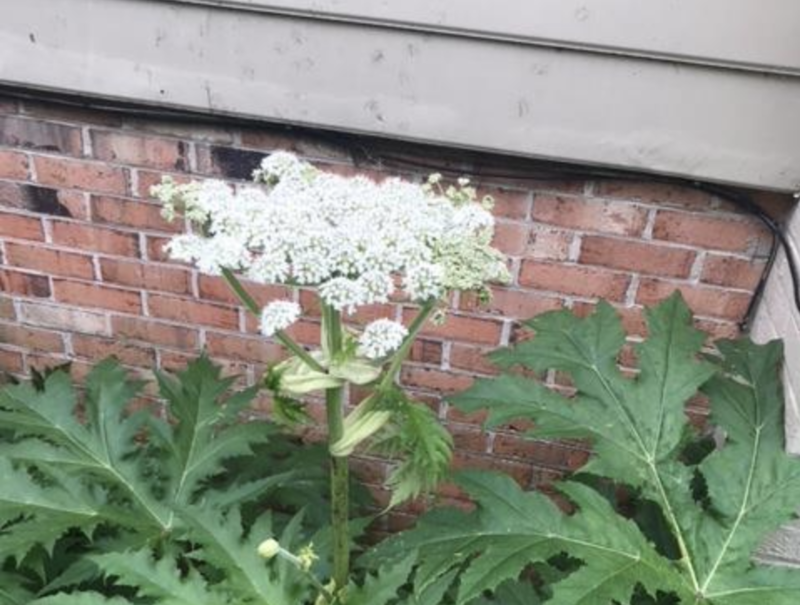 The Virginia Tech group posted photos of the plant on Facebook, urging anyone who comes across a giant hogweed plant to report it -- and be careful not to touch it. The dangerous plant also grows in New York, Pennsylvania, Ohio, Maryland, Oregon, Washington, Michigan, Vermont, New Hampshire and Maine. Its sap contains toxic chemicals known as photosensitizing furanocoumarins. When these chemicals come into contact with human skin, it can cause a reaction that makes skin extremely sensitive to light. The reaction also causes dark, painful blisters, which can leave scars. Touching giant hogweed can also lead to long-term sunlight sensitivity, and blindness if sap gets into a person's eye. When the plant spread across New York in the past, The New York State Department of Health recommended that anyone who came in contact with the plant wash it off with cold water immediately and get out of the sun. A toxic reaction can begin as soon as 15 minutes after contact. Call your health care provider in case of a severe reaction. The New York State Department of Health also recommends applying sunscreen to the affected areas, since this can prevent further reactions if you're stuck outside. Compresses soaked in an aluminum acetate mixture -- available at pharmacies -- can provide relief for skin irritations. If hogweed sap gets into the eyes, rinse them with water immediately, put on sunglasses, and contact your health care provider. These pesky plants spread when birds and waterways carry seeds to new locations. Seeds can grow for 10 years once they're dropped off. "Do not mow, cut or weed whack the plant, as it will just send up new growth and put you at risk for being exposed to sap -- the same kind of thing that would happen with poison ivy or sumac. Seek advice from professional plant control specialists about management options. If you must touch giant hogweed, wear disposable rubber gloves, a long-sleeved shirt and pants. If you get sap on your clothes, carefully remove the clothing to avoid skin and eye contact and wash separately from other clothing with warm water and detergent." Knowing what to look for and how to handle it could help you avoid a serious injury.